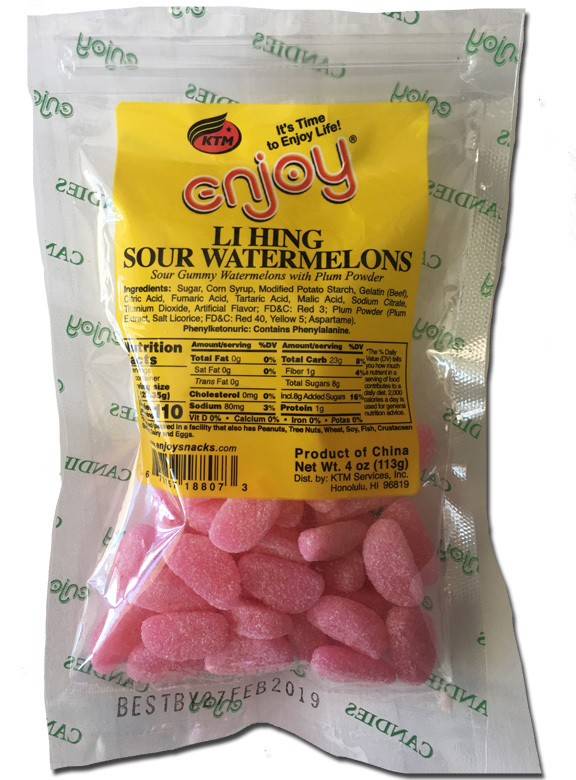 Home » 5 Freshest » Enjoy Li Hing Sour Watermelons: So good we reviewed them twice. You can get tan like it’s 1984, before a SPF 60 lotion was even a sparkle in the eye of the Coppertone research lab. In Hawaii it can downpour for 15 minutes then immediately turn into the most beautiful day of the year. There are beaches quite literally, everywhere, and you can surf and snorkel and swim and look pretty. Hawaii also has, maybe surprisingly, great sweets. Proximity to Asian countries helps. Especially in the case of these Enjoy Li Hing Sour Watermelons. Li Hing is salty dried plum. It has a very distinctive flavor – sweet, sour, and salty. SO f*(&ing good. And these watermelon sours are SO f*)%ing good. In fact, Jonny k i n d a reviewed these before. But his were made in Canada and sold in Hawaii and mine were made in China and sold in Hawaii. Plus the two types look very different. The ones I bought are smaller, thinner and straight-up pink. Jonny bought some that had two-tone coloring. But look, enough verse on who reviewed what and what they look like (and no, you don’t get a flower when you buy them – that was just my artistic touch). These little lovies are hard and chewy, fake watermelon flavor just like you like, salty but not too much, very tart and not too sour, and worth every bite. That’s all you need to know. Just go get them.